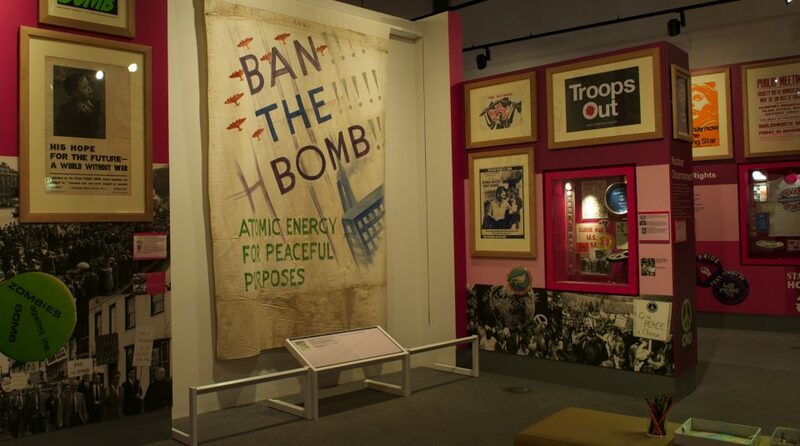 The first theme of Main Gallery Two is all about politics and protest post 1945. Rather than being revolutionaries, reformers, workers or voters, have we become citizens? This theme looks at Britain after the vote has been secured for all. Politics from 1950 to 1979, then 1979 to almost the present day. Politics moves to being more issue based rather than about political parties – war and peace, equality, LGBT+ rights, green issues, strikes and migration changes as a result of the end of empire. This section covers how time off was won as well as what people did with their new leisure time. Displays include information on working class leisure activities such as football, including items from the collection of the Professional Footballers’ Association (PFA), plus music and the Musicians’ Union. Time Off? also includes information on the Co-op, which was formed in Greater Manchester by the Rochdale Pioneers, friendly societies and the ‘saving for a rainy day’ philosophy. This area of Main Gallery Two is double height especially to showcase some of the museum’s most impressive and significant banners. Some of the banners are displayed showing both sides which gives a unique view. An audiovisual show helps to create the atmosphere of the culmination of a march or protest with crowds of people, lots of noise and banners fluttering in the wind. This is where you also have the opportunity to take a look into The Conservation Studio, a purpose-built space dedicated to conservation, specialising in the treatment of textiles. From the viewing area you can see the Conservation Team working on the museum’s collection, as well as objects being conserved for other museums, communities and private collections.